From October 12 to 14, EMBARQ México (WRI Ross Center for Sustainable Cities’ team in Mexico) will host the XI Cities and Transport International Conference, where decision makers will participate in workshops and discuss how infill development can help Mexico City and other cities achieve a connected, compact, and coordinated future. For more information on the Conference visit ciudadesytransporte.org. The responsibility of government is to safeguard the assets of a nation, including forests, beaches and roads—but above all: the citizens. To protect its people, the Mexican government has developed the Mexican Official Regulation, or NOM (the term used in Spanish). In short, NOMs regulate the construction of infrastructure, provide procedures for toxic waste disposal, and set quality standards for goods sold in the country. The ultimate goal of these regulations is to make Mexico a safer place to live; however, the NOMs have a critical fault: they fail to offer any mandatory guidelines for the construction of sidewalks. Instead, sidewalks are built according to cities’ local bylaws. Consequently, Mexican sidewalks are a patchwork of various designs, with quality ranging from good to terrible. It’s time for the Mexican government to address the issue by providing guidelines for sidewalk construction in its NOM framework. At first glance, the NOMs seem expansive enough to cover the construction of sidewalks. After all, they actively regulate the requirements, specifications, procedures and methodology for goods and services offered in the country. Furthermore, unlike the Mexican Standards (NMX in Spanish), NOMs are mandatory. However, in the field of urban infrastructure, not all contracted projects carried out by the three levels of the Mexican government are subject to NOM. Indeed, many public construction projects—like sidewalks—are allowed to be wholly designed by the contractors themselves, without being subject to a regulatory framework. This loophole is the product of a broader social agreement that encourages minimum regulation on the development of Mexican cities. That’s why we often see sidewalks of varying sizes, shapes, materials and elevations. 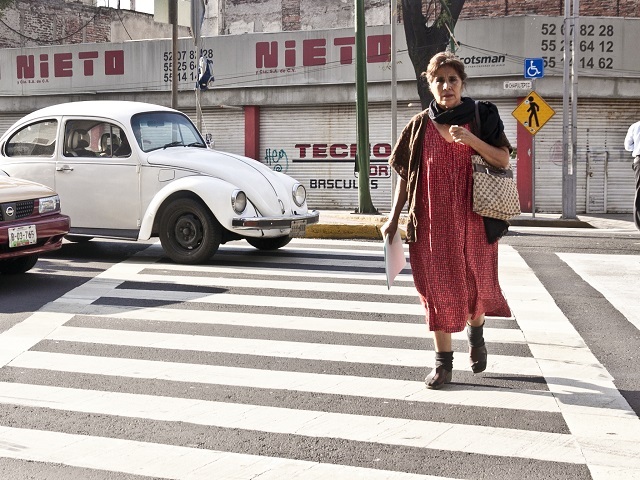 Unfortunately, many sidewalks fail to ensure the safety and mobility of pedestrians, according to the Pedestrian League (Liga Peatonal) and mobility activists in the country. Although they receive considerably less attention than roads, sidewalks play a pivotal role in the development of sustainable cities. If built properly, they create safe spaces for pedestrians, boost mobility, improve the local economy and better the quality of life of residents. However, in Mexico, 43 people are killed every day in car crashes, with pedestrians being the most vulnerable group on the road (22 pedestrians are killed daily). These reasons are why the Pedestrian League and other activist groups are demanding a NOM regulating the construction of sidewalks across Mexico. Having a framework for creating quality sidewalks will help make Mexico’s cities more people-focused, will provide safer and universally accessible spaces for pedestrians and will encourage citizens to walk instead of relying on personal vehicles. Furthermore, well-built sidewalks are critical for the creation of public spaces, and encourages citizens to be more physically active. Standardized sidewalks are especially important for citizens with disabilities. Without proper regulation, sidewalks in Mexico are often inaccessible to citizens in wheelchairs, forcing them to find alternatives or simply avoid some public areas. Moreover, residents with visual impairments and blindness greatly benefit when sidewalk construction is consistent and even. While poor sidewalks are an inconvenience to able-bodied citizens, they can be entirely inaccessible to people with disabilities. Simply put, sidewalks and walkways need to be based upon basic and mandatory criteria that ensure their quality and accessibility. NOMs can be a great solution for achieving this. For more on this discussion, follow the “#NOMBanquetas panel: how to generate mobility rules in Mexico?” on Monday October 12, 24:30 at the World Trade Center in the XI International Conference on Cities and Transport.